Mr Jiechi, how do you assess the state and prospects of Sino-Kazakh relations, in particular, cooperation of the two states? This January 3 we celebrated the 20th anniversary since the establishment of the diplomatic relations between the People's Republic of China of Republic of Kazakhstan. China was one of the first to recognize Kazakhstan's independence. Thanks to the personal attention and direct efforts of the Presidents the two countries enjoy sound and steady development of the Sino-Kazakh relations, expand friendly exchanges and cooperation in various spheres. The border issues were finally settled, important documents such as the China-Kazakh Treaty of Friendship, Neighborliness and Cooperation, Strategy of Cooperation of Kazakhstan and China in the 21st century were signed. The countries exchange high-level visits, deepen political confidence and mutual understating in key issues of mutual concern. The sides established the intergovernmental commission for cooperation, forge ties in trade and economic, humanitarian spheres, energetics and security, maintain close coordination of positions and cooperation in multilateral structures as the UN, SCO, CICA, etc. We are glad to see the Sino-Kazakh relations achieve unprecedented high level. Last June when President of China Hu Jintao visited Kazakhstan, the Heads of State announced the development of all-round strategic partnership between Kazakhstan and China, and put forward six proposals, namely, to become partners in political cooperation, trade and economic cooperation, humanitarian cooperation, scientific and technical cooperation, security cooperation, and international cooperation. China is ready together with Kazakhstan to fulfill in good faith the meaningful agreements the Presidents negotiated to further advance all-round strategic partnership and embark on a new brand level. 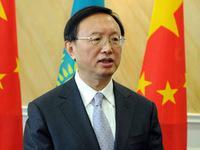 What could you say about the economic cooperation of Kazakhstan and China? Being neighbors, Kazakhstan and China, have great opportunities to deepen trade and economic cooperation. For the past 20 years since the establishment of the diplomatic relations the parties have expanded practical trade and economic cooperation based on the principles of mutual benefit and equality and it yields results. The commodity turnover made USD 20 bln in 2010. For the past 11 months of 2011 the sales grew by 22.1% against the same period of 2010 to make USD 22.57 bln. China became the largest trade partner of Kazakhstan, and Kazakhstan became the second largest trade partner of China among the CIS member states. What, in your opinion, are the prospects for Sino-Kazakh energy cooperation? Kazakhstan is abundant with oil and gas resources. China is one of the largest consumers of the world energy market. In recent years our energy cooperation eyed rapid development, the solid foundation for the practical bilateral cooperation was laid. The sides built jointly the first Chinese trans-border oil pipeline, the Sino-Kazakh pipeline. The Sino-Kazakh gas pipeline was built and put into operation at the close of 2009 as the main part of the China-Central Asia gas pipeline. Today's smooth operation of gas and oil pipelines contributes to socioeconomic development of both countries. Besides, the countries enjoy fruitful cooperation in development and processing of oil and gas raw material, implement jointly the project on the integrated gas chemical facility in Atyrau and a package of the other projects. Energy cooperation of Kazakhstan and China is of mutual benefit for it meets vital interests of both countries and nations. We are ready to continue our interaction with Kazakhstan in the spirit of mutual benefit, explore new energy projects, and expand cooperation to give a new impetus to boost bilateral ties. Last June Astana held the commemorative SCO Summit. China assumed the SCO chairmanship then. What could you say about the Organization's development prospects in the next decade? The commemorative SCO Summit held last June 15 in Astana ended with great success. The Heads of State focused on the way passed and summarized the fruitful results achieved since the establishment of the Organization. Too much has been done for the past 10 years. The member states concluded the Treaty of Friendship, Neighborliness and Cooperation, Strategy of Cooperation, signed Counter-Terrorism Convention on joint fighting against the three evils such as terrorism, separatism and extremism, also drug trafficking, arms smuggling, trans-border organized crime, advance security cooperation, defined long-term objectives of regional economic cooperation, implement large-scale projects in the areas of transport, energetics, communication, agriculture, signed agreements in the sphere of education, culture and healthcare, natural disaster response. It can be said the SCO has yielded impressive results for the past 10 years which benefited the member states and the SCO gained world-wide acknowledgment. The next 10 years the SCO will further support mutual confidence, strengthen mutual benefits and equality, respect diversity of cultures and civilizations and develop jointly the Shanghai Spirit to create the common and harmonious political environment, maintain peace and security, build up and develop mutual benefit environment. China, as the chair country, will hold this year the SCO Summit. This meeting will be of great importance for the development of the Organization. China will further promote cooperation in different spheres. The Development Strategy for the next decade will be presented there for approval of the member states. China will start and advance the cooperation program in conformity with the interests of all member states to lay the solid foundation for the future development of the Organization.